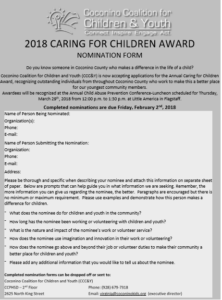 The deadline is approaching for our Caring For Children Award nominations. The person you thought of – fill out the form for them here or click on the picture to the right. This is a tremendous honor and will be a great experience for all winners, but they can’t win if you do not nominate! 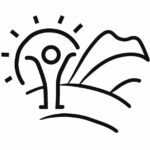 Do you know someone in Coconino County who makes a difference in the life of a child? 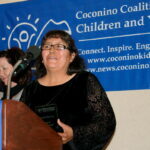 The Coconino Coalition for Children and Youth (CCC&Y) is now accepting applications for the Annual Caring for Children Award, recognizing four outstanding individuals from throughout Coconino County who work to make this a better place for our youngest community members.